“Wow, it smells great!” In a Tibetan kitchen full of aroma, visitors were admiring the Nixi native chicken stewed in a black pottery pot. The delicacy is coupled with matsutakes picked from the mountains in the morning. On the evening of August 27, a tourist group from afar paid a special visit to Nishi Township, 30 kilometers away from the government seat of Diqing’s Shangri-La City in northwest Yunnan. “Can you imagine what matters most for the dish? It's the pot! The Nishi black pottery is a national intangible cultural heritage in China!” The guide’s word was quite beyond the visitors. “So how is a black pottery pot made?” asked a visitor. Guided by locals, the visitors explored the Tangdui village, birthplace of the Nishi black pottery. “My dad was rated as a national inheritor for the heritage earlier this year. However, he’s out now.” That day, the 26-year-old Larong Xiaoba received the guests at the Shangri-La Black Pottery Company, on behalf of his father. “Can you show us how to make a black pottery pot?” A visitor dubiously asked the young fellow, who looked gentle and kind of shy. “Of course. 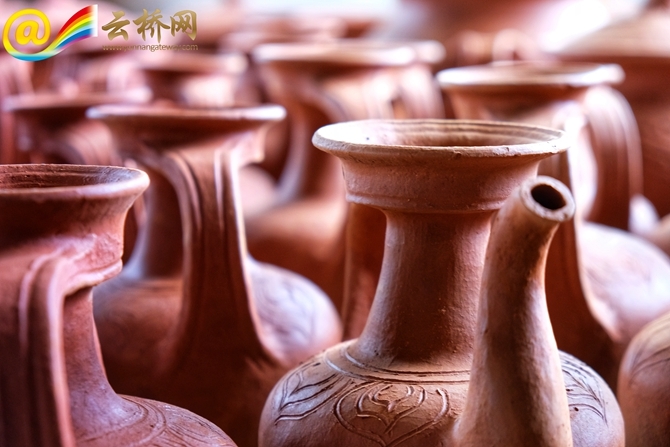 Mine is a family of the black-pottery tradition, and I’m the 8th-generation inheritor.” At the question, Larong Xiaoba got serious and answered with pride. Larong has been familiar with black pottery since his childhood. Two years ago, he returned to the village after graduating from the Yunnan Minzu University as a major in Tibetan Language and Literature. He followed his father’s steps and worked for the home business. Now, he can do all the 38 types. 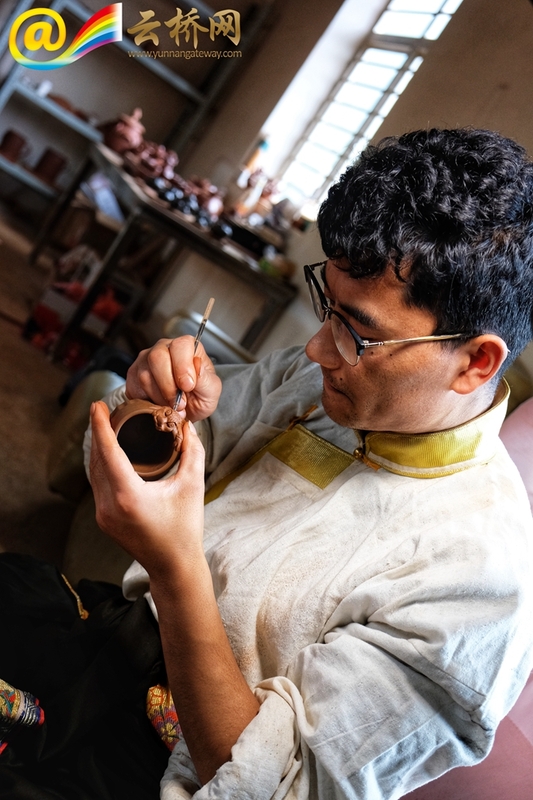 Sitting in the factory, Larong Xiaoba carefully picked up a clay cup and began carving with a knife. Gradually, the image of a naughty water unicorn became clear. Then Larong showed the visitors his black-pottery wares one by one, coupled with detailed instructions on the craft. To finish a black-pottery cup, ten plus tools and seven steps within two weeks are needed. As for making a black-pottery pot, it is necessary to have more tools and go through more steps. Larong Xiaoba’s mastery in the clay art is largely attributed to his family influence. However, the university graduate will not limit himself to the traditional black-pottery field of his forefathers. Based on the craft, he wants to try something new. 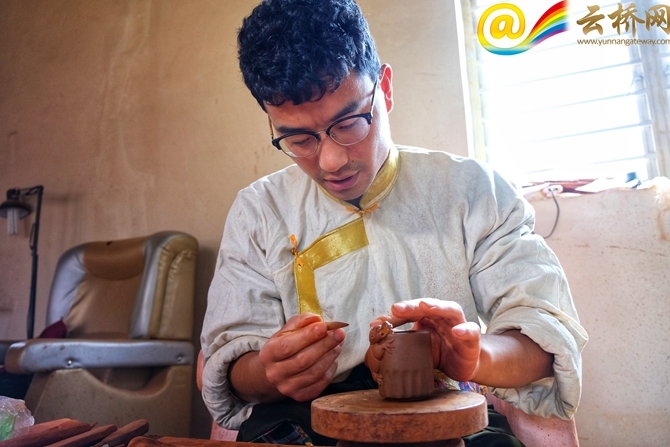 Larong said that he plans to open a distinctive rural guesthouse and then join hands with locals to build the village into a tourist town featuring the black-pottery art. At the topic, the young man in muddy clothes got excited and vigorous. With growth of the holistic tourism in Shangri-La, the Nixi township also benefited from tourism. The town lies near the thoroughfare and is famous for local heritages and delicacies. This summer, Larong’s home-bred business saw dozens of tourists from home and abroad every day. 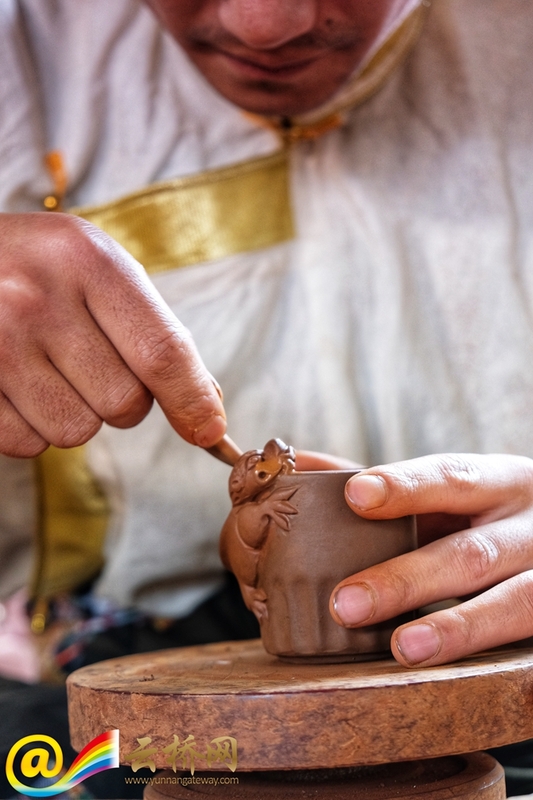 They came to visit and experience the craft, and some even kneaded their own original clay wares. They generally stay for hours, or half a day at most. Seeing off the visitors, the workers would continue the steps left, and the finished black-pottery products will be sent to the tourists later. Some of Larong’s wares have reached the Taiwan region. Such service has won much praise, but Larong Xiaoba wants to do better. In his eyes, his hometown is beautiful, with peach blossoms in spring and matsutakes in summer. Folk customs are unique. “Visitors’ staying here is too short to get a full picture of the lovely place,” said Larong. He wants to team up with local villagers and open a guesthouse, so that the visitors can stay here for a day or longer. In his vision, the future Tangdui village should be a tourist town of arts, quality, and pleasant stays, and a beautiful place with peach blossoms, lush woods, singing birds and lovely flowers. 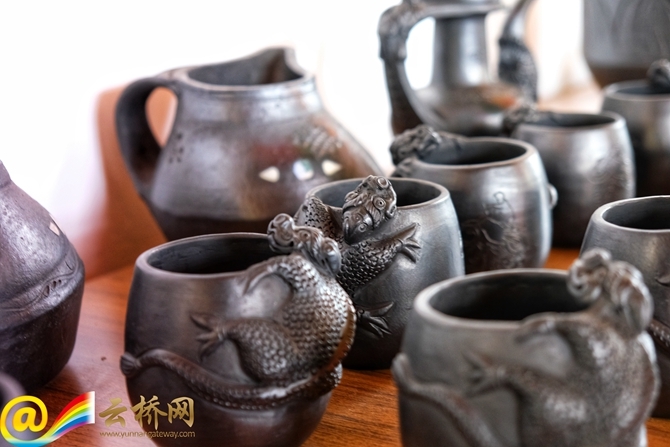 Now black pottery is a lifestyle in Nixi Township. 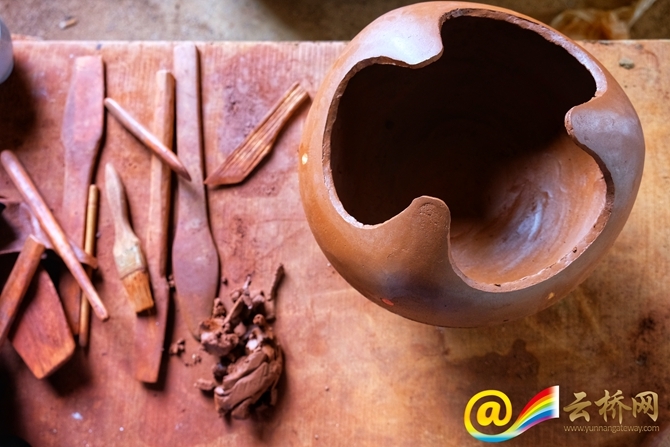 Of the 170 plus households of villagers in the Tangdui village, over 140 are engaged in black-pottery making. The 3,000-year cultural heritage has come back to life. In the future, black pottery is expected to be inherited by more Nixi youngsters like Larong Xiaoba.